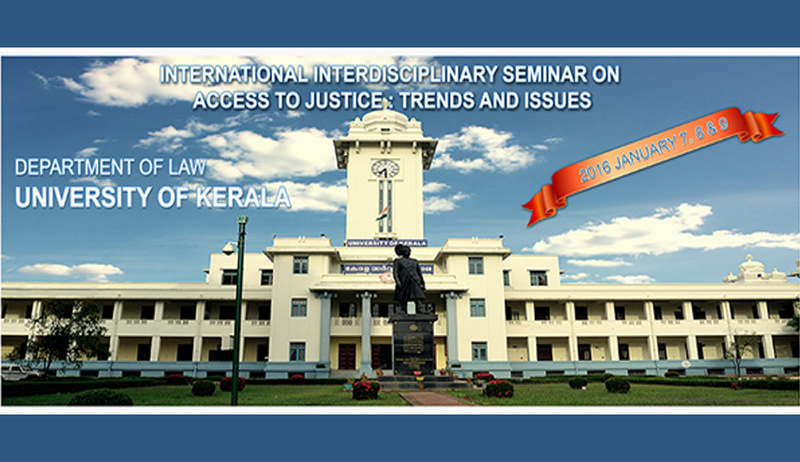 Department of Law, University of Kerala is organizing an International Interdisciplinary Seminar on Access to Justice: Trends and Issues. The organizers of the Seminar calls upon the legal profession, academicians from other social science disciplines , administrators, University students, young and upcoming research scholars, social activists and the representatives of governmental and nongovernmental organizations to present their research papers relevant to the themes. Rewards: Three Separate Best Student Paper awards will be given for the Graduate, Post graduate and Doctoral level student authors. The abstract should be mailed to Dr.K.C.Sunny, Professor and Head Department of Law, University of Kerala (seminarslawdpt@gmail.com ) on or before 15th July 2015.